Asbestos is a naturally-occurring mineral that was manufactured into a popular insulating material for many years. From the 1940’s until 1978, when they were banned from further production and use, asbestos was installed in commercial and residential buildings across the United States. While highly flame-resistant and energy-efficient, asbestos is prone to flaking. Microscopic asbestos fibers are released into the air and, when inhaled, can lead to serious illness. While buildings constructed after 1978 use other methods of insulation, older buildings may still contain materials created from asbestos. Here are the most common construction materials created with asbestos. Home Insulation: The spaces between wooden studs in walls and ceilings are often filled with insulation to retain heat within the home. Insulation was once one of the most popular residential insulation materials, and is also one of the most prone to flaking. Pipe and Duct Insulation: Steam heating and hot water ducts in many homes were encapsulated in insulating blankets comprised of asbestos. While they may appear intact, any cracks or seams in the outer coating could quickly lead to asbestos contamination. 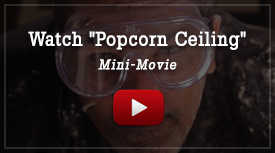 Ceiling Tiles: Due to their easy installation and soundproofing qualities, asbestos ceiling tiles were a popular choice for U.S. homes, especially in basements. Common tile sizes are 9×9 inches and 12×12 inches, and are slipped into a grid system that holds them in place. Wallpaper: Wallpapers that curl and peel around the edges may be tempting to scrape and remove, but older wallpapers should first be tested for asbestos. Both the papers and adhesives used in older vinyl wallpapers often contained this toxic substance. Other products within the home that could contain asbestos include stove and oven covers, vinyl and rubber flooring, or even drywall compounds. Most importantly, homes built before 1960 frequently contain more than one product with the potential to contain asbestos. 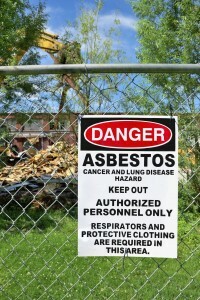 This underscores the importance of hiring licensed professionals to detect any asbestos-containing materials (ACM), as asbestos is not often immediately apparent. Asbestos is a contaminant that not only leads to chronic illness, but can be a catalyst for other serious health issues that do not require sustained exposure, such as lung cancer. These diseases can take up to 30 years to develop, so limiting exposure is imperative. Mesothelioma takes years to develop, and is almost always fatal by the time it is diagnosable. Non-cancerous diseases such as asbestosis can still result in difficulty breathing and shortness of breath, and are degenerative. Hiring an environmental testing consultant is the most effective method of ensuring that asbestos was not used in your home. By measuring the air quality as well as inspecting all the likely suspects of asbestos, such as wall insulation, H2 Environmental will definitively show you whether your house is a danger, and provide a clear plan for removal should any hazardous materials be discovered.